Hariyali murgh tikka is a delicious dhaba style snack .Boneless chicken pieces marinated with a paste of coriander and mint along with spices and grilled to perfection. You can also make the same recipe with chicken drumsticks too. 1. Clean the chicken and cut into big cubes. Soak the satay sticks in water for a couple of hours before using to avoid burning. 2. Grind together all the ingredients mentioned above. 3. Marinate the chicken with it adding salt and garam masala at least for 2-3 hours. 4. Put the chicken pieces in the satay sticks. Grilling time varies depending on the oven size. Am inviting myself to ur place,irresistible tikka. 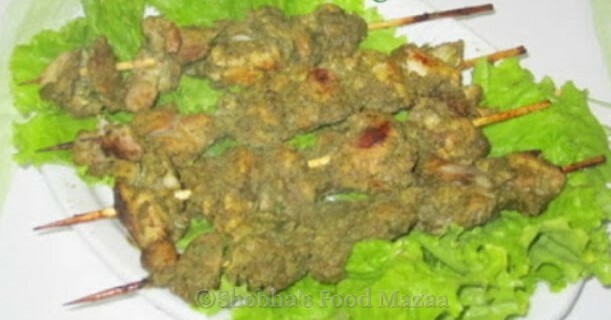 yummy and delicious...will try ur tikka..
Yummy & tempting green tikka. Wow shoba the tikka looks very inviting.Love it. Inviting and delicious one !! !